Guinea-Bissau, a West African nation, boasts 88 islands and several national parks. Settled in what looks like a botanical wonderland, the majority of the population – 80 percent - relies on agriculture for their survival. But farmers struggle to produce enough food to feed their families throughout the year. Political instability, irregular rainfalls and volatile food prices have been exacerbating their struggles. More than two-thirds of the population lives below the poverty line. Overall, around 10 percent of the population doesn’t have enough food to lead a healthy life; in some areas, this figure can be as high as 50 percent. As a result, migrating to bigger towns, to neighboring countries or to Europe is not uncommon. In Pitche village in the far east of Guinea-Bissau, 15 youths have just learnt something new: to farm fish in floating cages. Some 50 others have learnt to sustain themselves by growing and selling cassava. Before joining this FAO-supported project, they all had one thing in common - unemployment. Although the Corubal River is close by, villagers have only been engaging in limited subsistence fishing. No one had the knowledge, skills or means to try their hands at aquaculture. But the youth did have enthusiasm, and with support from FAO, they set up three sites filled with 45 floating cages, ready to farm fish. FAO provided all the materials – construction materials, nets, tools – and the fingerlings and fish feed, and accompanied the youth for six months – time it takes for the fingerlings to grow into full-bodied, healthy fish. As FAO was working to supply the fingerlings and fish feed, the youth built the cages and moored them up the river. Then they filled each cage with 2,000 fingerlings – a delicate balancing act requiring stepping from one small wooden plank to another on the floating structure. Over the next six months, they fed the fish three times a day, kept incessant watch – keeping lizards and birds away, and the nets cleaned - and monitored the water level. Every month, they would weigh the fish to ensure they grow at the right speed, and adjust the feed. 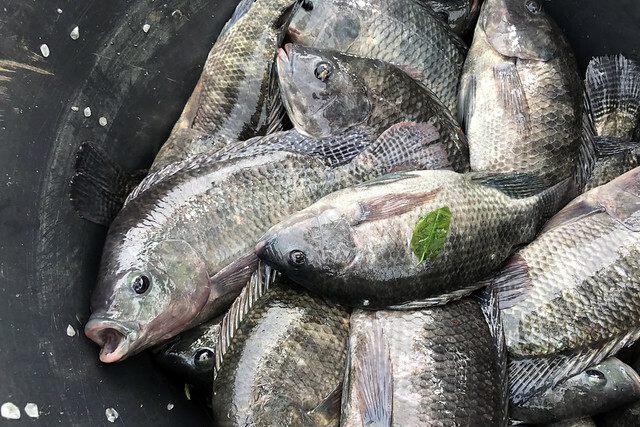 When the harvest came, the fresh and healthy tilapia was in high demand. In the past, the fish would be brought from the capital; it was expensive and inconvenient. And so, the villagers appreciated the tasty fish and wanted more, and the young people felt encouraged to continue. Next, they invested part of the earning to buy fingerlings and feed for the following cycle. During each cycle, the young people farm about 90,000 fish or about 22.5 tons of fish. Per year, this amounts to about 45 tons of fish. The youth also built a hatchery so that in future fingerlings could be supplied locally. This has provided employment opportunities for more villagers. “We have been living in the capital. But seeing how well this is going, we want to stay here now. We could make more money here, and live better than in the capital where life is expensive,” said Fatou. The fish and cassava initiatives led to people seeing life in their village in a different way. Those who have been dreaming about “escaping” their village, have started seeing the advantages of staying. “I gave up the idea of migrating when the project started. Some of our friends who had unsuccessfully attempted to migrate to Europe have now returned and joined the project,” said Abbas Embalo who is part of the cassava growing initiative. The young fish farmers are keen on continuing to broaden their knowledge and learn from their experiences, and save enough money so that they can expand their fish farms. If funds come in, FAO aims to train more youth in aquaculture in Guinea-Bissau and in the region, and to form cooperatives so that the fish farming initiatives can remain sustainable. To date, with the support of the African Solidarity Trust Fund for Food Security, FAO trained 150 youth in farming fish in six countries across West Africa. Find out more about FAO’s aquaculture initiatives.